So I know I promote myself a lot. I'm not ashamed of it. If you don't know how to promote yourself, you'll never make it. It's just part of the job. But for 99% of the shows I put in my Twitters and Facebook statuses and all that, I'm really just saying "hey, this is happening; you might like it." I very rarely ASK people to come to shows. But this is one of those shows where I'm kind of asking people to come out. 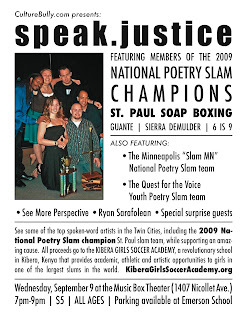 Aside from being a GREAT show (three incredible poetry slam teams from MN: Minneapolis, Quest youth team and National Poetry Champion St. Paul; plus others), it's raising money for a really amazing cause, the Kibera Girls Soccer Academy. This is a school in Kibera, Kenya (the second largest slum in the world) that's doing some unbelievably good work. Read up about it. Donate to it. Come to the show. 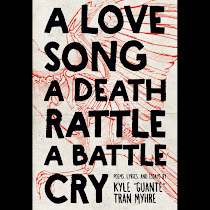 Wednesday, September 9th at the Music Box Theater (1407 Nicollet) in Minneapolis. ALL AGES. $5. 7pm. See you there!